I just wanted to post a quick photo of what I’m working in at THIS very moment. I recently ordered a bodysuit online and though the measurements were right on the site, it came in totally wrong. So, I decided I should alter it myself. 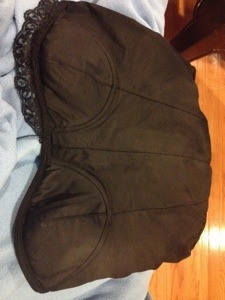 Right now I’m lacing it up over the bust area because…things like to pop out with the way it currently is. We can’t have that.